** SOLD Thanks Robin and Family! Black and white tobiano filly. Both eyes dark. Email us for more info on Aces Classy Sugar Bar. 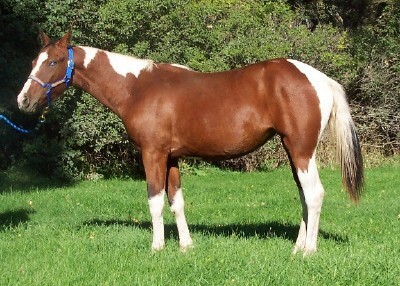 **SOLD Thanks Kaley** Bay Tobiano filly, full brother starting barrel racing. This one will be on the shorter side, 14.2. Nice laid back disposition. She has 45 rides on her now, checking pastures and trail rides. Email us for more info on AcesTreasuredRockette. 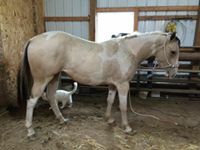 **SOLD Thanks Jenny of Minn.**This colt is registered as a bay but he just might turn buckskin! Very nicely marked and has Red Sonny Dee and Go Man Go in his pedigree. Email us for more info on Alley Cat Ghost. **SOLD Thanks Jo!! 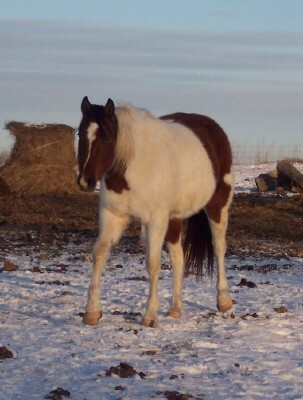 Trigger is bay tobiano and 15 hands tall with a stout build. He is a very easy going gelding with tons of potential. Broke to ride and has had alot of miles put on him this summer, been on over-nite trail rides, checking pastures and leisure rides. Rides out alone or with others. Email us for more info on Allys Chocolate Baby. 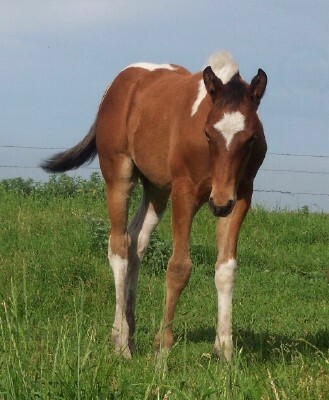 ** SOLD Thanks Kerrie** Lineback dun filly with 4 high stockings. Registered and haltered. Email us for more info on Ariel Doc Tari. **SOLD Thanks Jim in Florida! 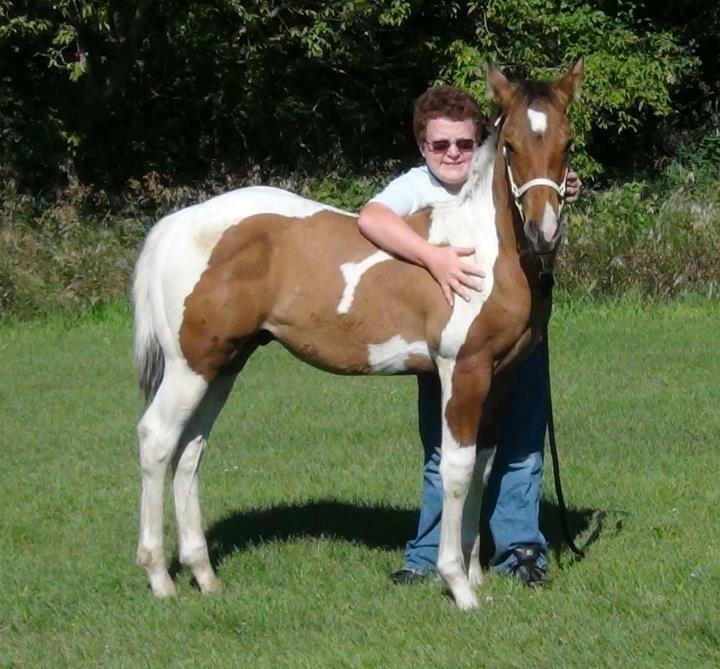 ** Bay Tovero APHA colt. Email us for more info on Ashton Ghost Hustle. **SOLD Thanks Kirsten** Bay and white filly, one partial blue eye. 16 hands.Broke to ride, very calm sweet girl. Easy to catch and ride. Been on trail rides and checking cattle. Email us for more info on Asia Showgirl. 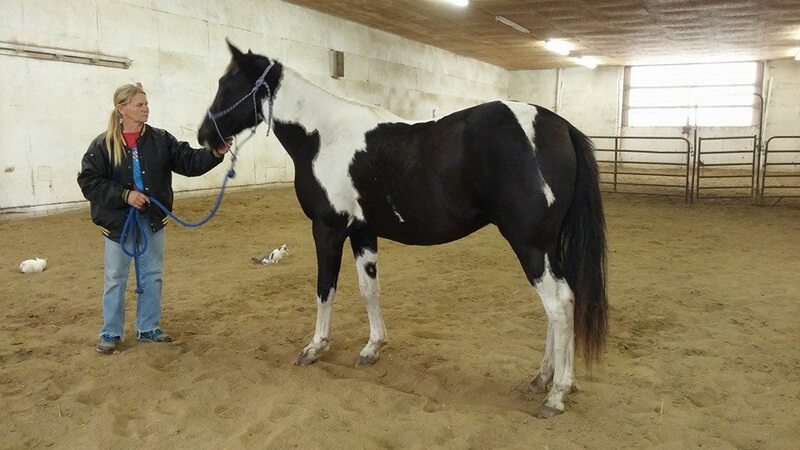 **SOLD Thanks Dana and Renee** Black and white tobiano gelding. Moony is an extremely flashy colt with a solid build and sweet personality. Been on trail rides and rounding up cows. Email us for more info on Astro Moon. 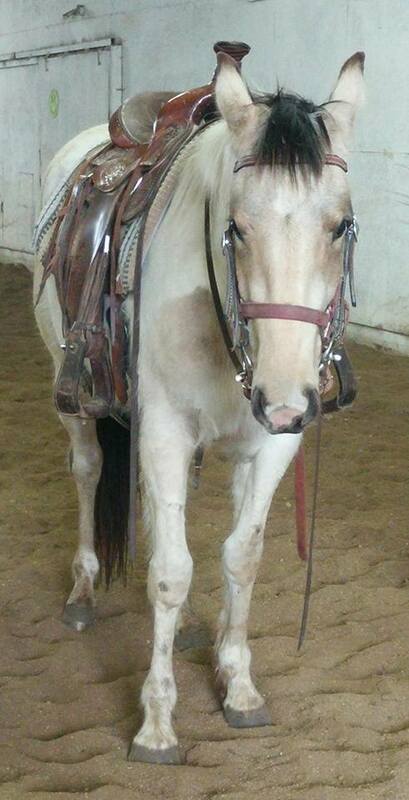 ** SOLD Thanks Bailey** Palomino breeding stock paint mare. Started training now. Email us for more info on Autumn Golden Sunset. SOLD Thanks Carmen of MN!! 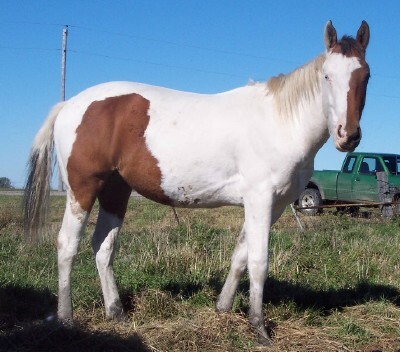 LOUD colored bay and white tobiano gelding out of a black Quarter Horse great-granddaughter of Dash for Cash and granddaughter of Barne's Azure bug. 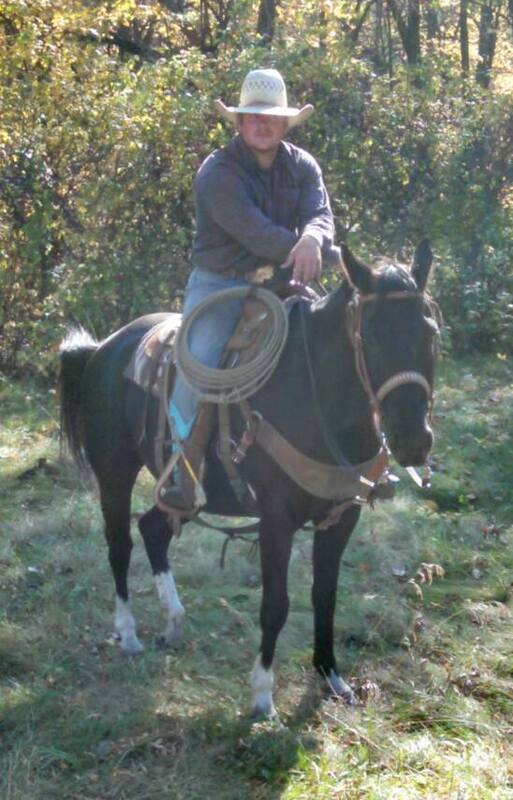 45 days professional training and I have been riding him for a year and half, he is being trail riden and checking pastures and rounding-up cattle (he has a natural cow instinct). Also being riden in the barn this winter. He is well-mannered and laided back, with an easy stop. Azure will make someone a great all around mount-- whether you ride English, Western or just down the trail, he'll take you there! Email us for more info on Azure Dashin Cash. *SOLD Thanks Tracie* Update; "Love the new horse! He is awesome, THank you so much!" 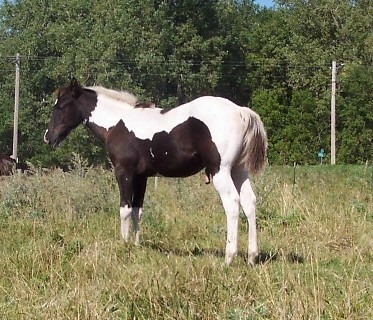 Black and white tobiano gelding that stands 16 hands. Broke to ride and being rode daily down the road and checking cattle. 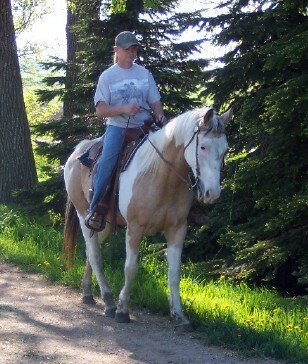 Been on over night trail rides, rides fine with other horses or off by himself. His temperament and athletic ability should allow him to be suitable for almost any direction you want to go; Western, English, Speed events or just an all around great family horse! Email us for more info on Black Icey Express. **SOLD Thanks Brian and Sam** Blue eyed gelding. Email us for more info on Blue Eyed Sparky. 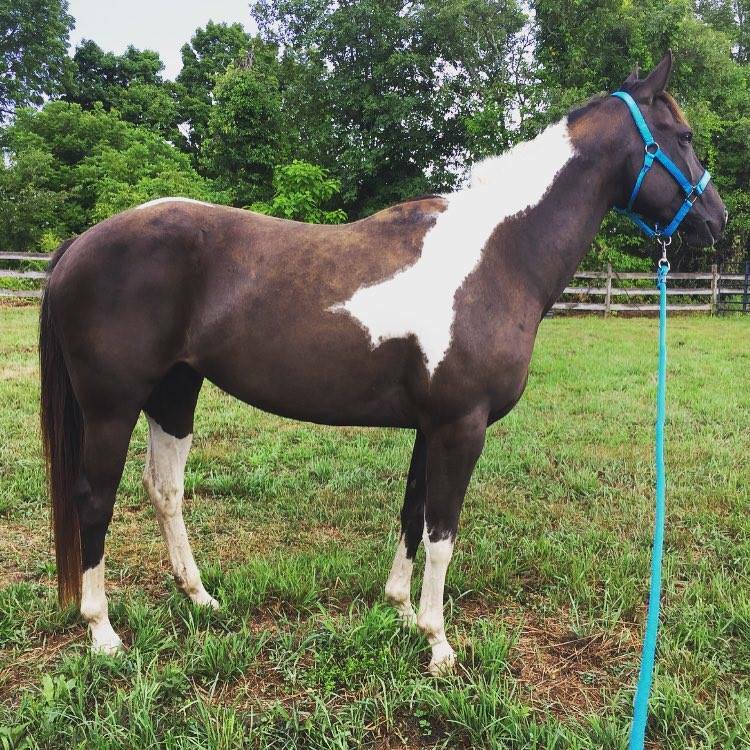 **SOLD Thanks Carli** Dark bay tobiano gelding. Email us for more info on Blue Jean Cruiser. Email us for more info on Brandy Dancer. Thanks Nicole!! Her pedigree has performance and speed to burn with Champion bloodlines of Bugs Alive in 75 and Gallant Ghost. She will make a great performance prospect in any discipline, whether you ride roping horses or barrel horses, she'll put you in the money! Bugs has 60 days riding and is proving to be a willing partner. 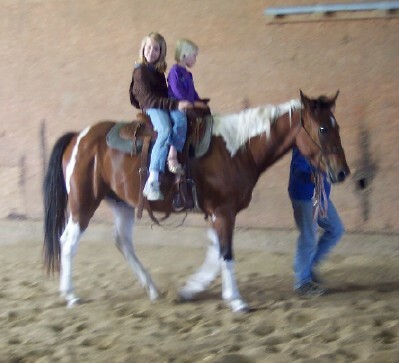 Is being ridden in an indoor arena this winter. Email us for more info on Bugs Gallant Royalty. SOLD Thanks McKenzie!! 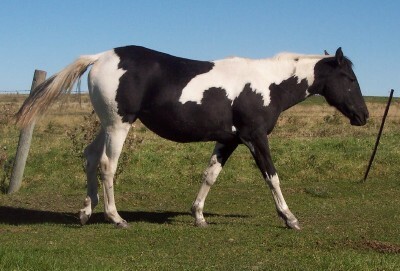 Flashy black and white tovero gelding, 2 blue eyes with eyeliner. Stands at 15.1 hands, his size and athletic ability should allow him to be suitable for sporthorse events, he has a nice flat-kneed trot. 90 days under saddle, ready to go in any direction. Email us for more info on Caspian Seahorse. ** Sold thanks Lydell & family** Bay and white tobiano filly. Both dark eyes, will mature to 15.1. Halter broke, leads, loads, ties and current vet work. Email us for more info on CC Ghost Rider. SOLD Thanks Ben!! 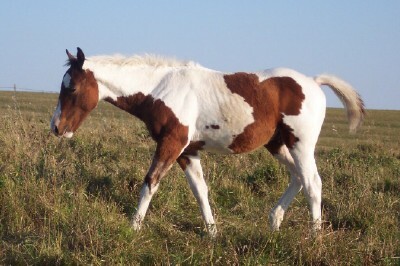 Bay and white colt, both eyes dark. Challenger is an extremely flashy colt with a solid build and sweet personality. He will mature to 15.3 hands. Consider him for you next roping or team penning mount. Started his training now, price will go up as he progresses. Email us for more info on Challenge the Stars. 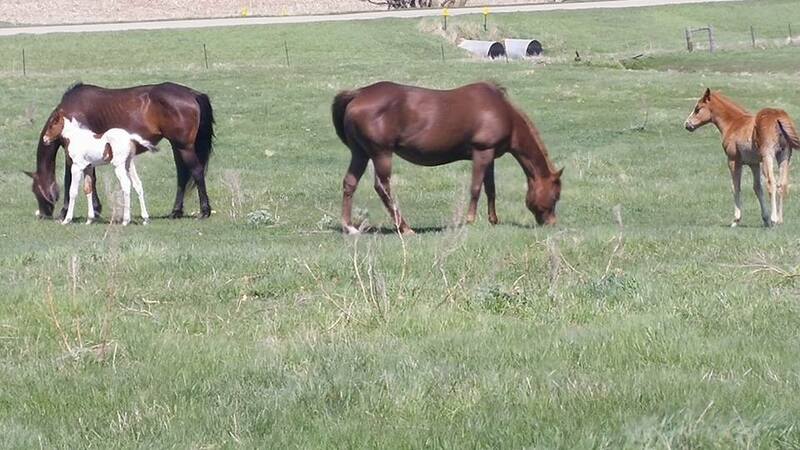 AQHA/FQHR mare with Wimp just off her papers.I have a 2015 filly out of her by a son of Dash Ta Fame. Email us for more info on Chesters Star. Email us for more info on Cheyanna Anna Quinn. ** Sold Thanks Kristy** Dun tobiano filly. Doc Tari bloodlines. Email us for more info on Chrome Duncaps. Thanks Stephanie & Tyler! 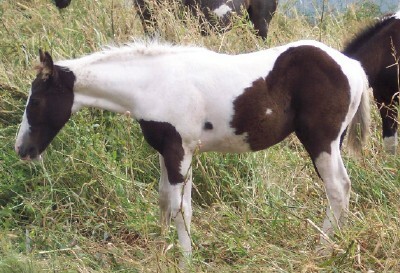 Black and white filly, both dark eyes. Email us for more info on Classic Sheba. 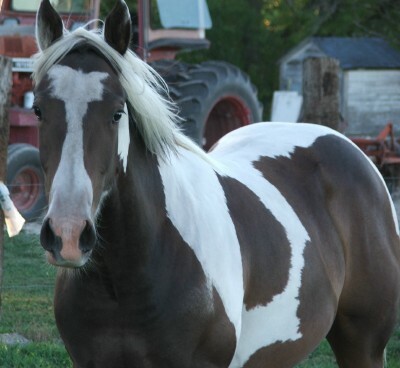 *Thanks Joanie** Buckskin tobiano gelding, both eyes dark. Azure Te and Barnes Ladybug bloodlines. There is not much that shakes him up. Super easy going. Email us for more info on Colonel Sunfire. **SOLD Thanks Jodi & Frank**Bay and white filly, both dark eyes. Both parents are 15.3. Mare also for sale. Email us for more info on Comet Star Flashpoint. Thanks Tucker & Lindsey!! 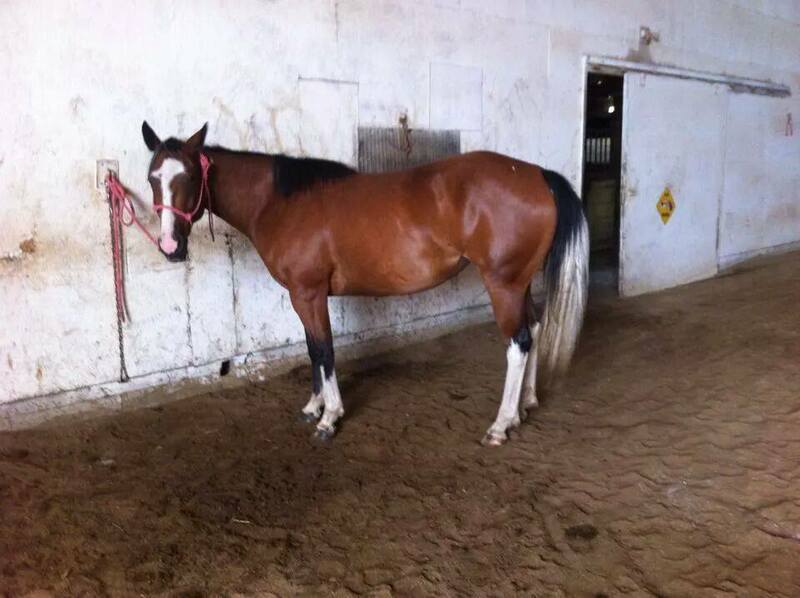 16 year old bay solid paint mare, stands 15.3hands tall and well broke to ride. 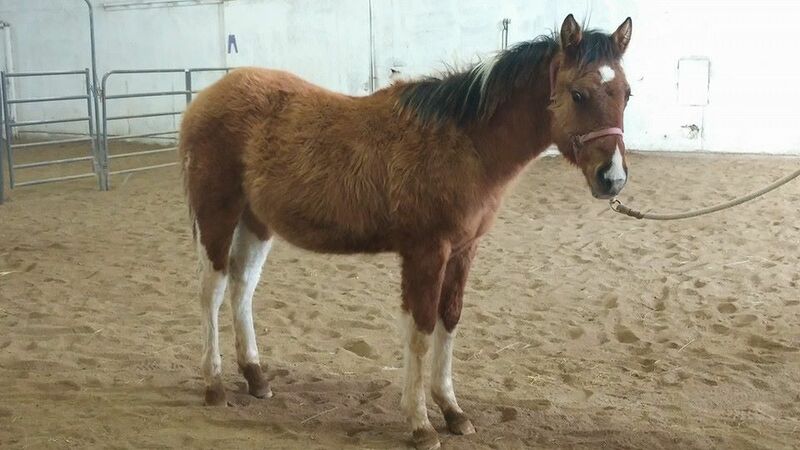 Sweet mare anyone can get along with, rides out by herself or with others. Comet has always been a horse I could just pull out of the pasture and go for a nice ride. She steps right out and is a smooth ride, isn't spooky, and just fun to ride! Dusty hay will make her cough. Email us for more info on Comet Star McCue. **SOLD** Thanks Dina!! 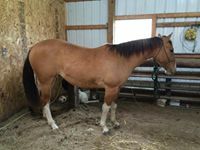 Big 15.3 hand lineback dun breeding stock mare with 4 white socks. Bred for 2018 to Exclusive Patch. She has had some nice dun foals. Email us for more info on CR Dunit in Themovies. SOLD Thanks Bev!! 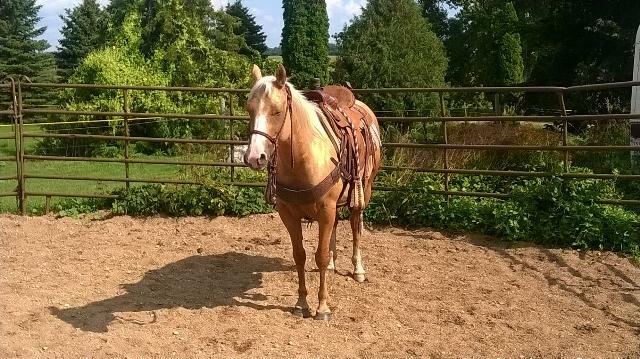 Tobiano palomino mare broke to ride. *Just an update. Finally got the chance to take "Rye" out and she is everything you promised. We love her and are looking forward to many years of enjoyment with her. Email us for more info on Da Lady Ryeissa. 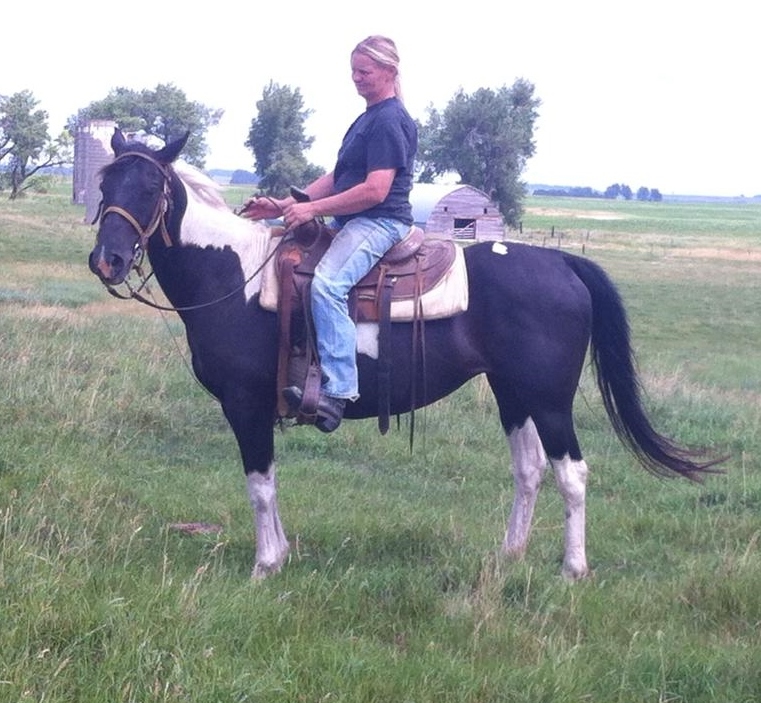 ** SOLD Thanks Colleen** Black and white gelding. Doc Tari bloodlines. Broke to ride been on overnight trail rides and to some playdays. Email us for more info on Dakota Taris. SOLD Thanks Durwin of AZ** Tovero colt with two blue eyes. Email us for more info on Dakotas Lightning Bar. 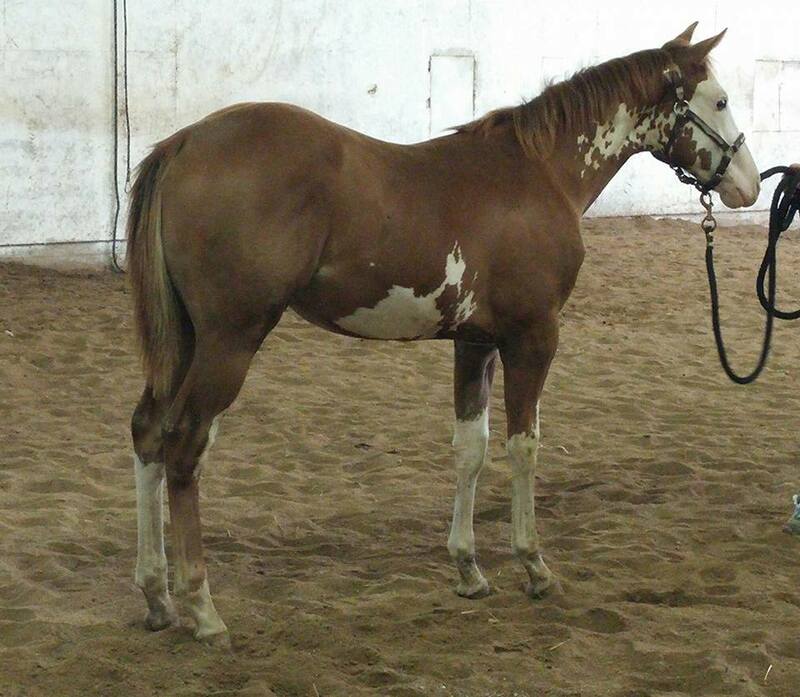 SOLD Thanks Durwin of AZ** Buckskin tobiano filly. Email us for more info on Dakotas Mighty Peppy. ** SOLD Thanks Britanie** Bay tobianio gelding. He poked his eye and did lose the sight in it. Email us for more info on Dante Riggin. 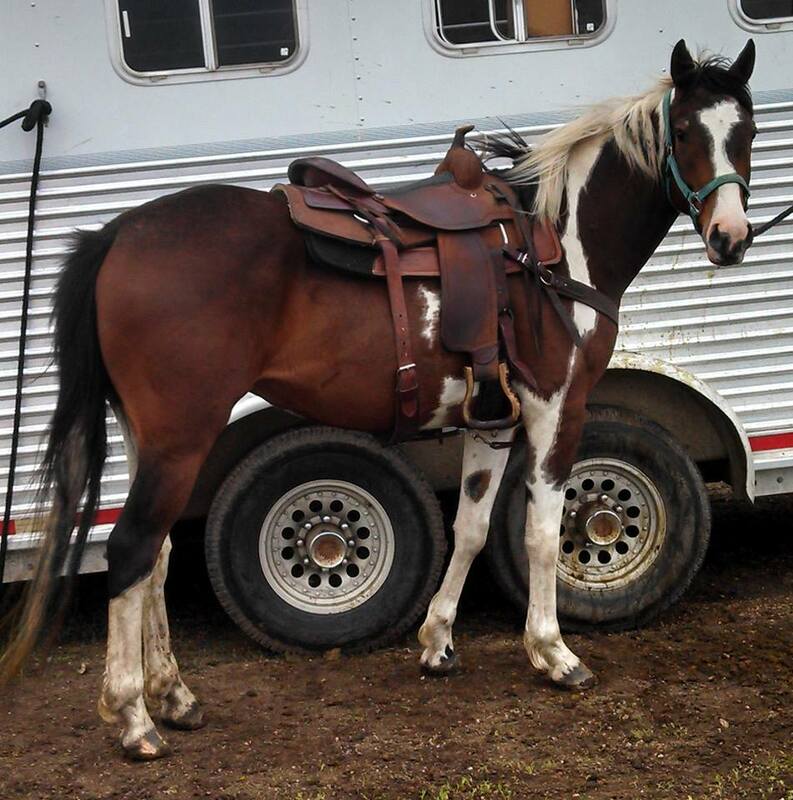 **SOLD Thanks Jacob** Black and white gelding. Stands 15.2 hands. 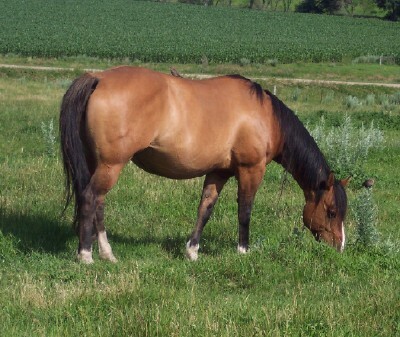 He is a ranch gelding, Rounded up cattle out of pastures. Has had rope thrown off him and drag a tire in the arena. Has worked at the salebarn. Goes where he is pointed, thru water and all. Also, been on overnight trail rides. Email us for more info on Dark Sea Breeze. SOLD Thnaks Michelle and family!! 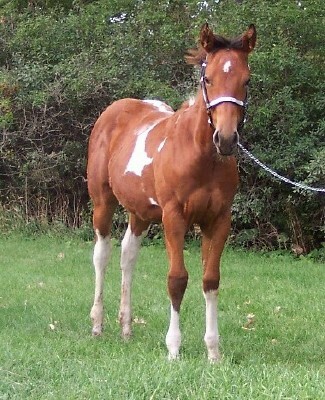 Bay and white tobiano filly, 15 hands tall. Broke to ride, easy to catch and work with. Great ground matters, good for farrier. Rides off of leg cues, will ride alone or with other horses, lead or follow. 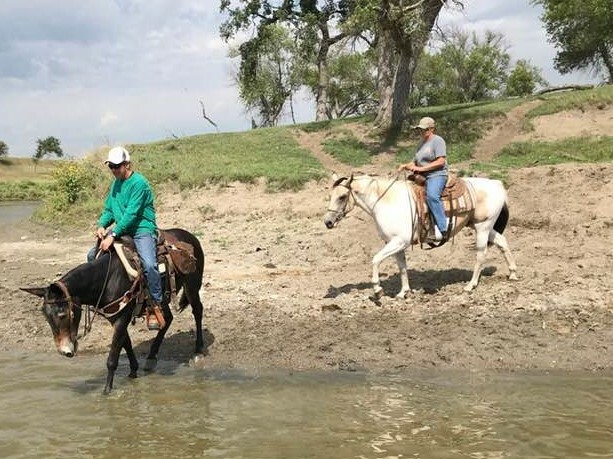 Being used now on overnite trail rides and gathering cattle, has potential for more. She has done everything asked of her. Pedigree includes Lucky Sonny Dee and Deck of Stars. 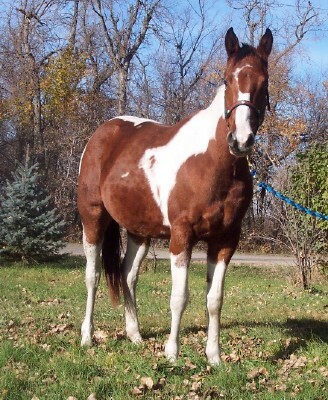 Sire is the homozygous APHA grandson of Gallant Ghost and she will produce athletic, colorful babies someday! Email us for more info on Decks of Stars Chick. Bay (may roan) and white stud colt. One eye blue. 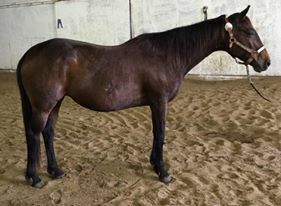 Email us for more info on Diamond's colt. 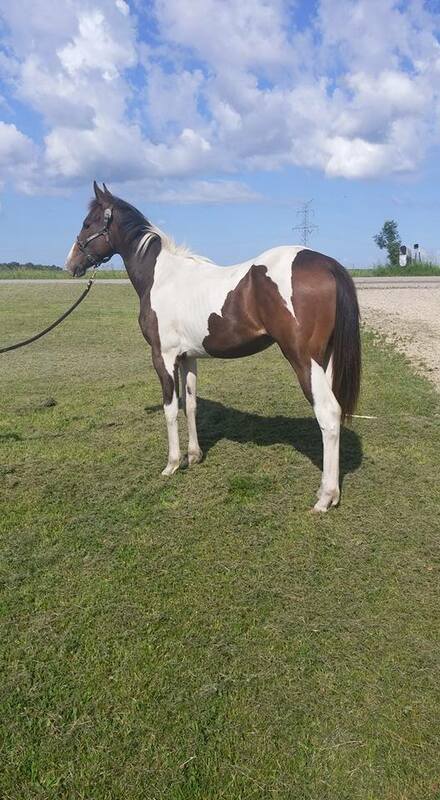 **SOLD Thanks Joanna of Texas** Chestnut overo stud colt. Grandson of Dash Ta Fame. Registration papers are here. Weaned, haltered, leads, loads and ties. Email us for more info on Dice on the Dash. 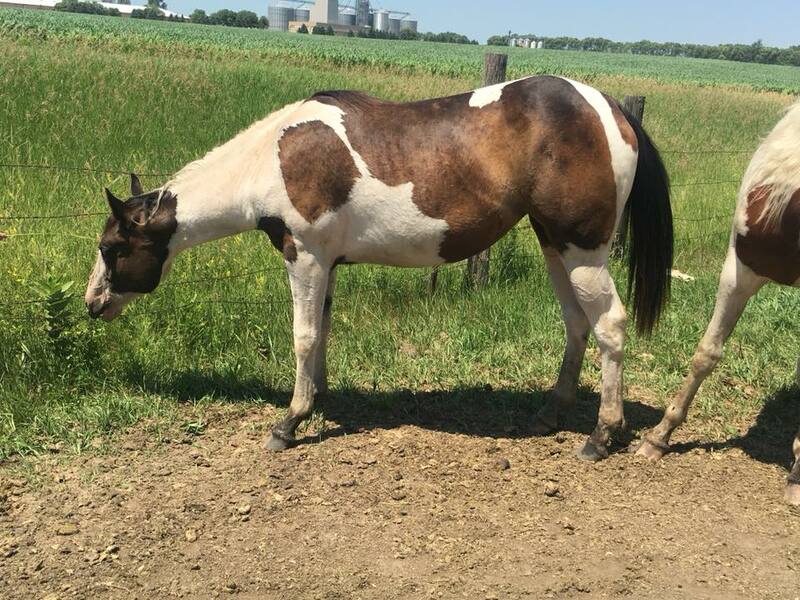 **SOLD Thanks Corissa for, ND** APHA solid colored filly. Granddaughter of Dash Ta Fame. Mare has Barnes Azure Bug in pedigree. Registration papers are here now. Email us for more info on Diva Ta Fame. Email us for more info on DJS Painted Magnum. 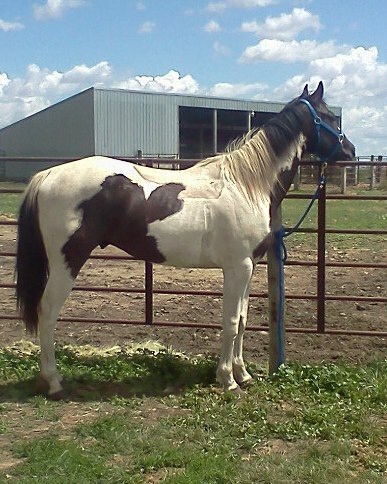 **SOLD Thanks Ronnie of Alabama** APHA Bay tobiano gelding. Email us for more info on Driftin Gentle Ghost. Email us for more info on Dun it with a Ghost. Bay and white tobiano filly, Azure Te bloodlines. Registered. Email us for more info on End Caps. 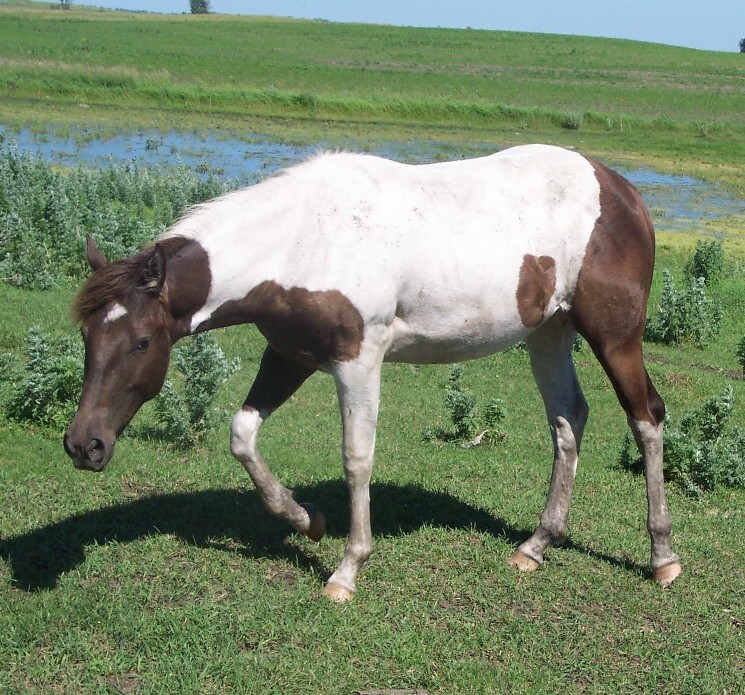 **Thanks Kayla from ND** Buckskin tobiano colt possible homozygous. Email us for more info on Exclusive DiamondKing. **SOLD Thanks Carli** Black and white, blue eyed filly. Email us for more info on Exclusive Secret. 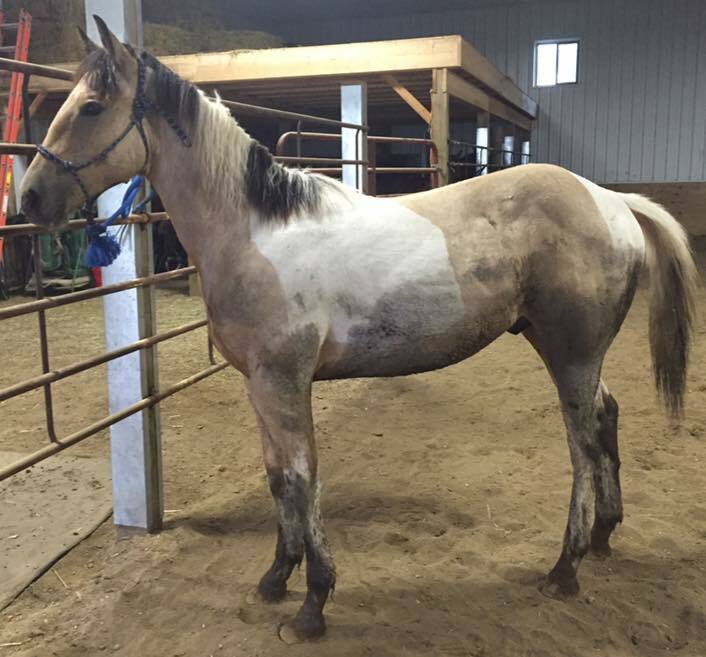 ** Sold Thanks Teresa ** Buckskin colt with some great markings. Email us for more info on Exclusives Fire. ** SOLD Thanks Kerrie** Buckskin tobiano filly. Registered and haltered. Does have a scar on one hind foot but is sound. Email us for more info on Extra Classy Style. **SOLD Thanks Star, Good Luck showing** Bay and white tobiano PtHA filly. Email us for more info on Famous Fame Flame. Thanks Jodi** AQHA filly. Granddaughter of Dash Ta Fame. Mare is double registered with Foundation QH Registry and has Wimpy just off her papers. Weaned, haltered, leads, loads and ties. Email us for more info on Fancy Fame Seahorse. **SOLD Thanks Kendra and family** Buckskin tobiano filly with Azure Te bloodlines. Started in training now and is very laid back filly. Email us for more info on Fifty Shades of Gold. 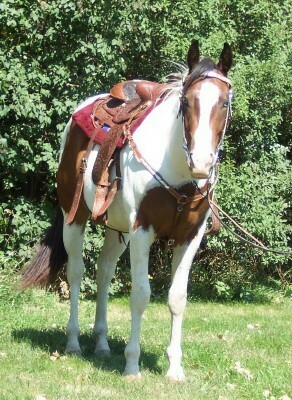 **SOLD Thanks Michelle and Bill** Bay and white APHA tobiano filly. Email us for more info on Firered Quinn. 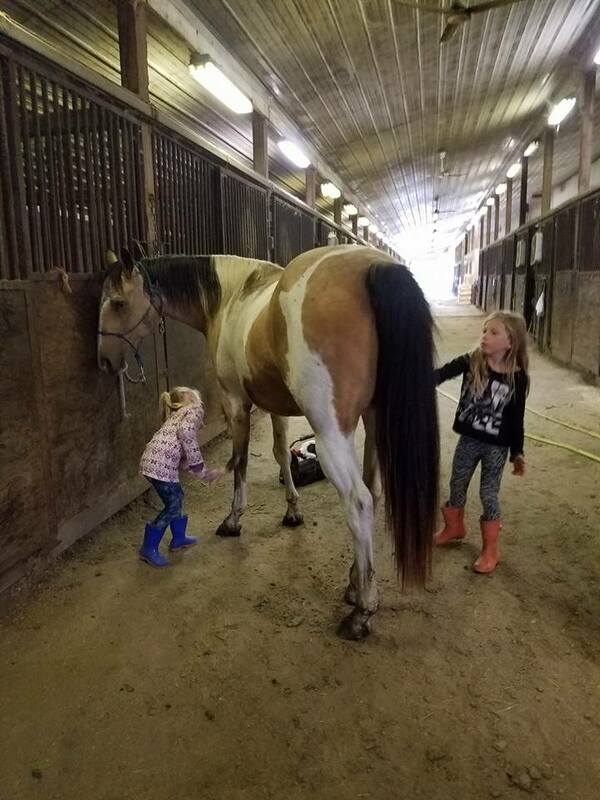 **SOLD Thanks Darin and family** Bay tobiano colt, very friendly. Email us for more info on Fleeting Charmer. ** SOLD Thanks Jessica** Grandson of "Dash Ta Fame" bay tobiano gelding. Out of an Ace daughter with Kingfisher McCue and Jet Deck in bloodlines. Email us for more info on Frosted Fame SeaRider. SOLD Thanks Amber** Bay and white tobiano filly. Both dark eyes, 15.2 hands, born and raised here. She is well muscled and built to work and takes an interest in cattle. 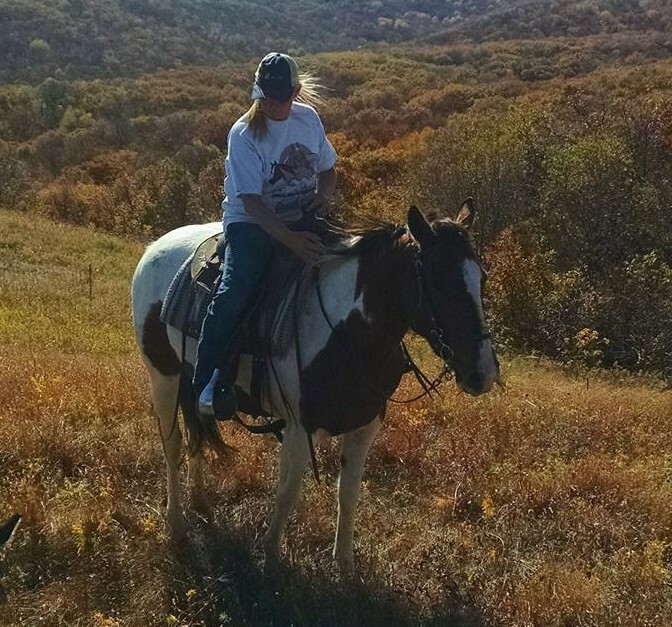 I have been riding Galaxy for a couple of years now, we have put on lots of miles doing overnight trail rides, checking pastures and fields, also using her for putting miles on greener horses. She is very willing and responsive. Email us for more info on Galaxy Star McCue. 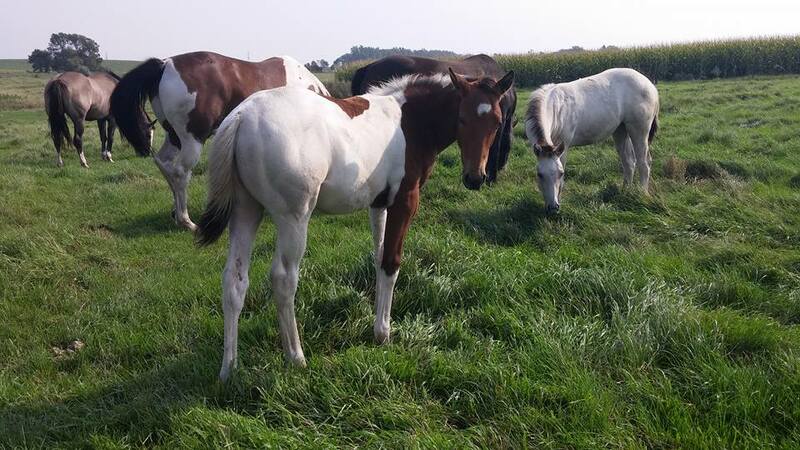 **Sold thanks Lydell & family**APHA Bay Tobiano filly. Email us for more info on Galient Jetta McCue. 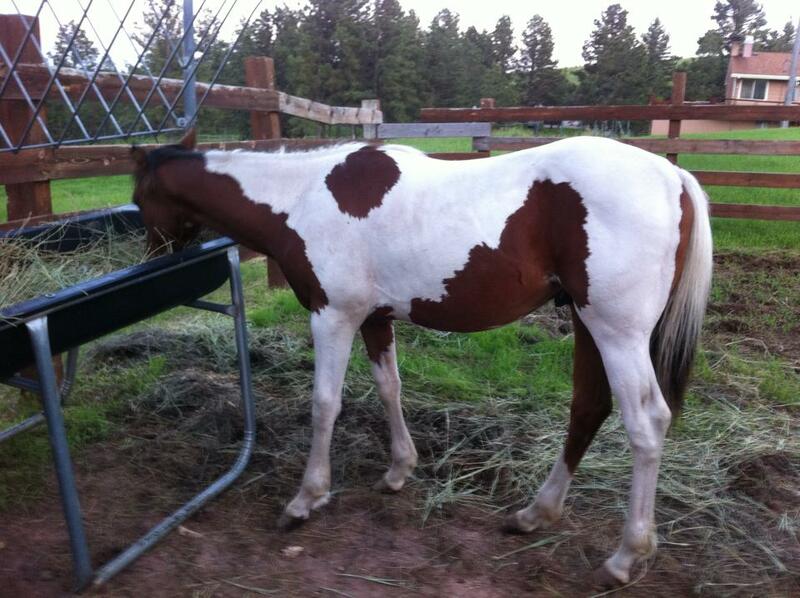 **SOLD Thanks Cara of Wyoming** Bay and white tobiano BIG filly. Both parents stand 15.3 and she has lots of body to go with it. Email us for more info on Gallant Comet Star. 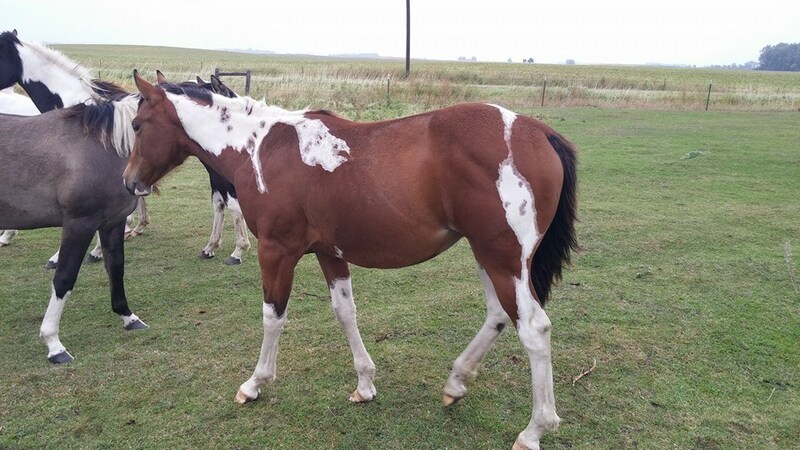 ** SOLD Thanks Kerrie** Black and white tobiano filly. Registered and haltered. Email us for more info on Gallant Poco Nita. 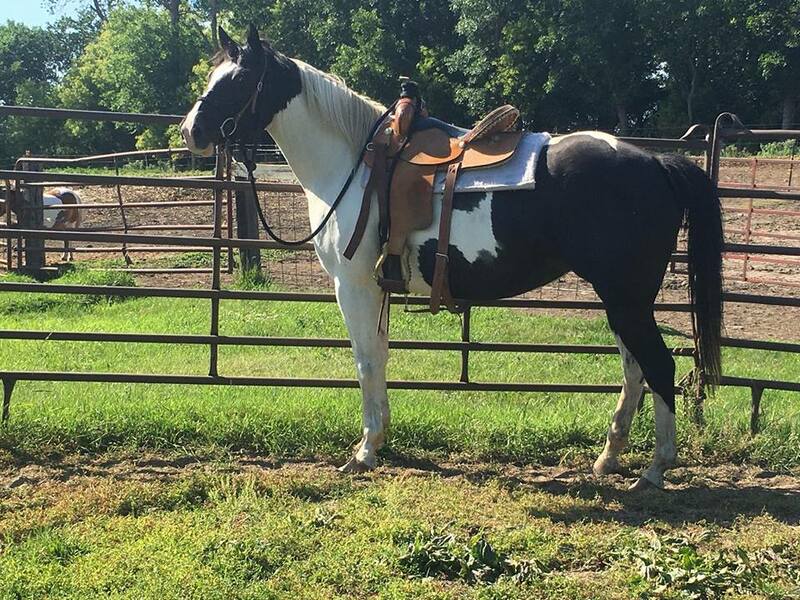 SOLD Thanks Duffy of Wyoming** APHA Black Tobiano Gelding. Email us for more info on Gallant Prince Admiral. **SOLD Thanks Krystal in Alaska!! Black tobiano filly. Email us for more info on Gallant Queen McCue. Email us for more info on Gallant Storm Drifter. Email us for more info on Gallant Winged Faye. 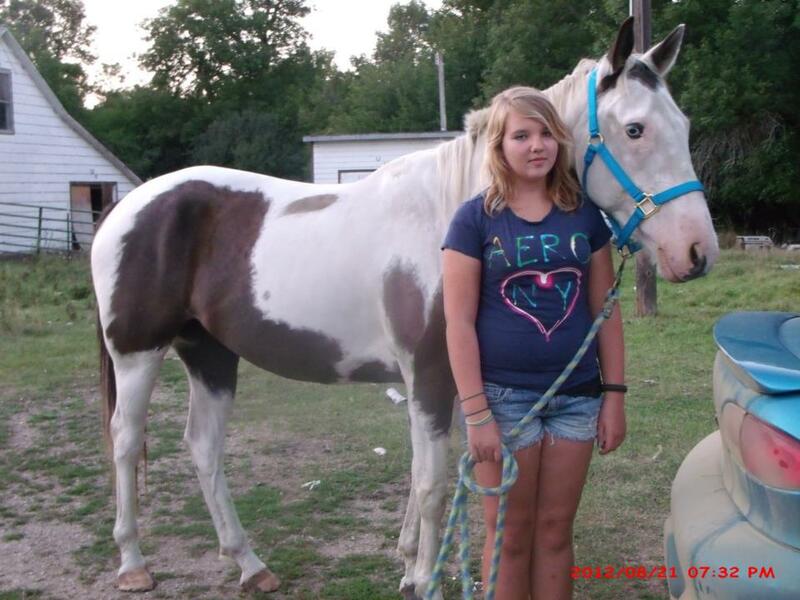 **Thanks Jeff and family** Bay and white gelding, 2 dark eyes. Decker is a lovable boy with a performance based pedigree, he will make a great family all-around prospect! Has 30 days riding under saddle in the indoor arena, price will go up in the spring when we can get more consistent miles outside. Email us for more info on Gambler on Deck. 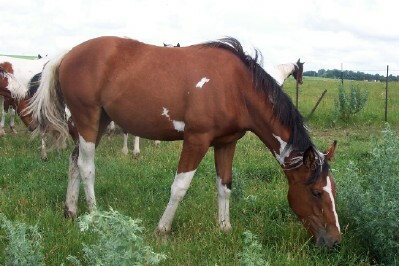 **Thanks Joanie** Bay and white tobiano colt. Email us for more info on Gamblers Yahtzee Dice. **Sold Thanks Kallan**Black and white tobiano filly. Pedigree goes back to Princequilla and War Admiral. Broke to ride. Update "Quilla is doing great. I took her for another ride today and she was terrific. Thanks!" Email us for more info on Ghost Quilla. *SOLD Thanks Blaine & Jenny! Twister is joining her older brother in MN. Bay and white filly, dark eyes. Email us for more info on Go Ally Twister. SOLD Thanks Shawn!! Dark bay, blue eyed tovero filly. Email us for more info on Go Go Ally Girl. Email us for more info on Go Harlequinn Ghost. SOLD Thanks Robin!! 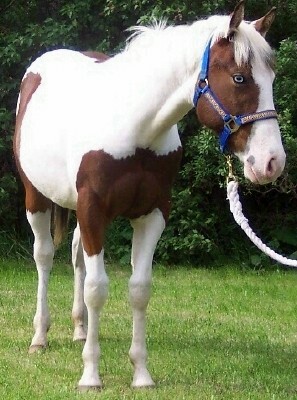 Buckskin tobiano colt with blue eyes. Email us for more info on Golden Fox Fire . Thanks Tyler and Stephanie!! Bay and white filly, both eyes dark. Print is a sweet girl with a pedigree and color that will make a great all around prospect. Email us for more info on Gone to Print. **SOLD Thanks Andre of North Dakota** Grand Rivera has that great black tobiano color that everyone is looking for and is so hard to get - he also has the athleticism, temperament and pedigree to go with it! Already standing 15+ hands, he is ready to start under saddle and is a possible hunt horse contender. Email us for more info on Grand Rivera. 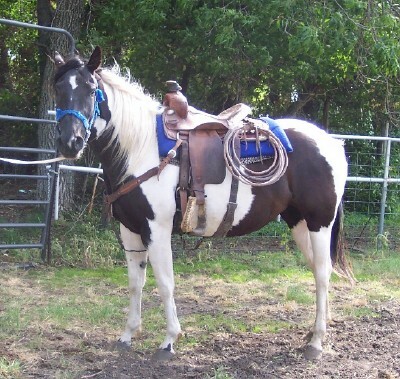 **SOLD Thanks Oryon** Black and white gelding, big boy already 15 hands. Email us for more info on Grand Riverman. Email us for more info on Great Chees Patch. 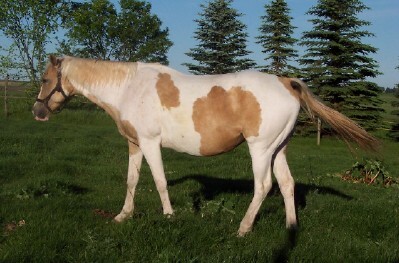 Whitey is a light colored quarter horse palomino mare. Bred for 2013. Email us for more info on HH Classy Shi Bert. 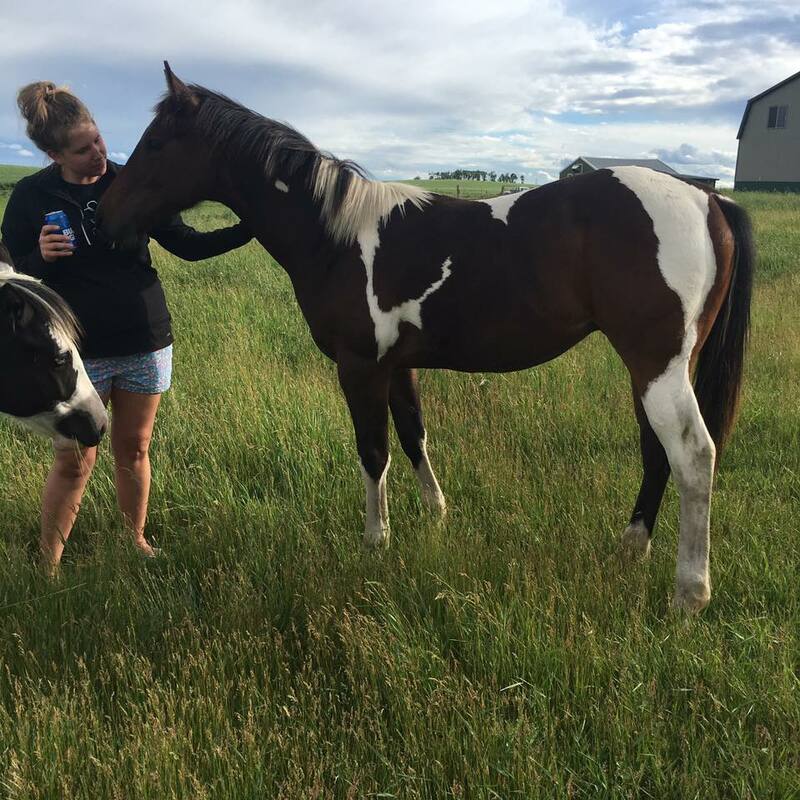 **SOLD Thanks Lauren** Black and white tobiano gelding. Hotrod has that eye-catching color that everyone wants AND the conformation and temperament to back it up. His pedigree boasts the likes of APHA Champions Gallant Ghost and Kingfisher McCue-- let him take you in any direction you wish to go. 45 days professional training. Likes a faster pace. Email us for more info on Hotrod Jet McCue. 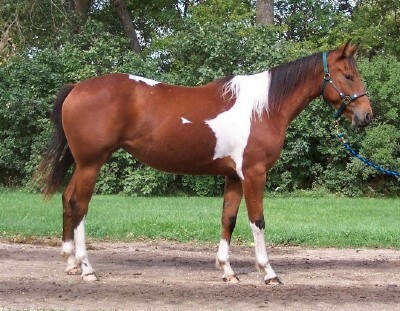 ** Sold thanks Chad and family* Bay and white tobiano gelding. Both dark eyes. Hustler is a stocky boy that will mature over 15 hands. Consider him for your next roping or team penning mount.In training now. Email us for more info on Hustlers Zip Code. **SOLD** Thanks Dina!! 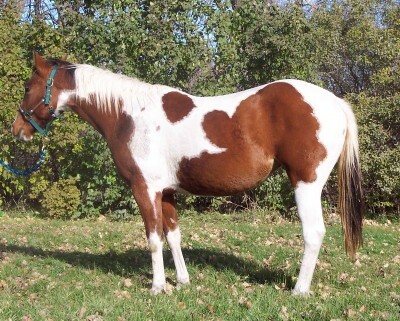 Bay breeding stock paint. Stand 15.1, broke to ride. Very pretty head. Bred for 2018. Email us for more info on Ima Jet Deck McCue. 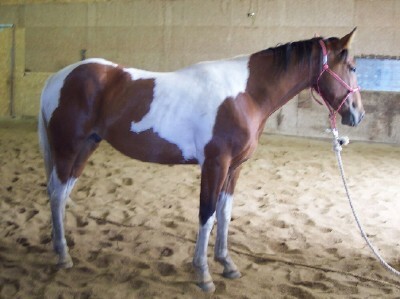 **SOLD** APHA bay with no white on her at all. 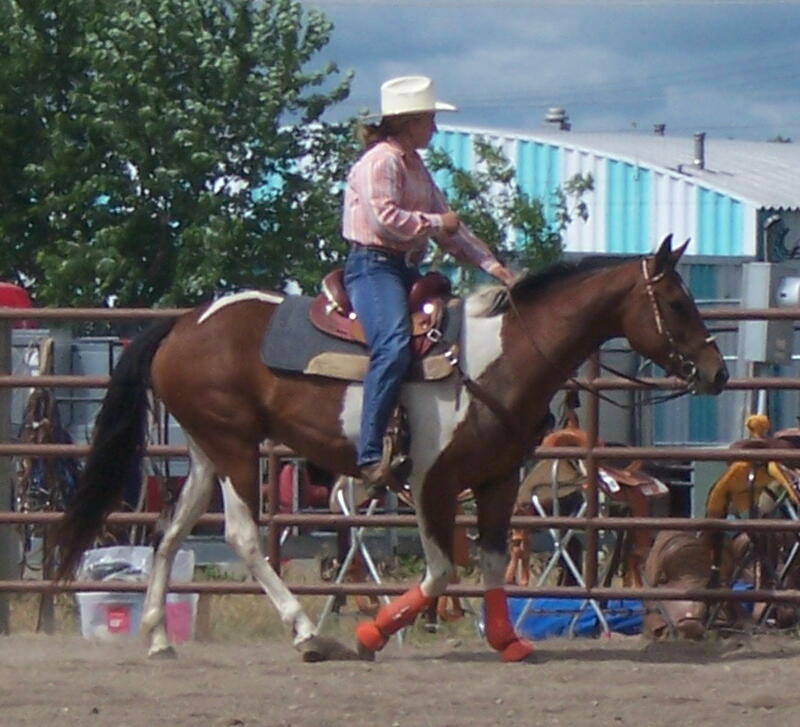 Broke to ride and was started on barrel training until her trainer became ill. 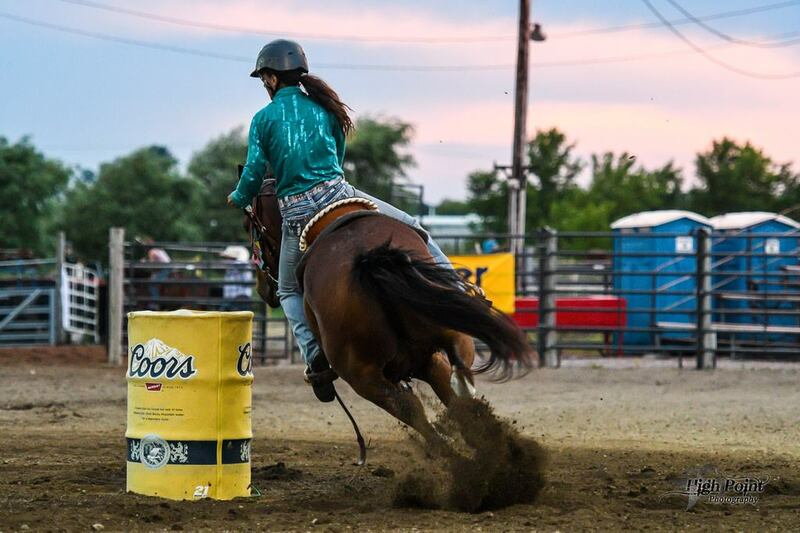 Her son is starting his career as a barrel racing and doing awesome. She is an athletic mare with speed in her pedigree- granddaughter of Treasured and Raise Your Glass. Bred for 2018 to Exclusive Patch. Email us for more info on Indeed a Beauty. 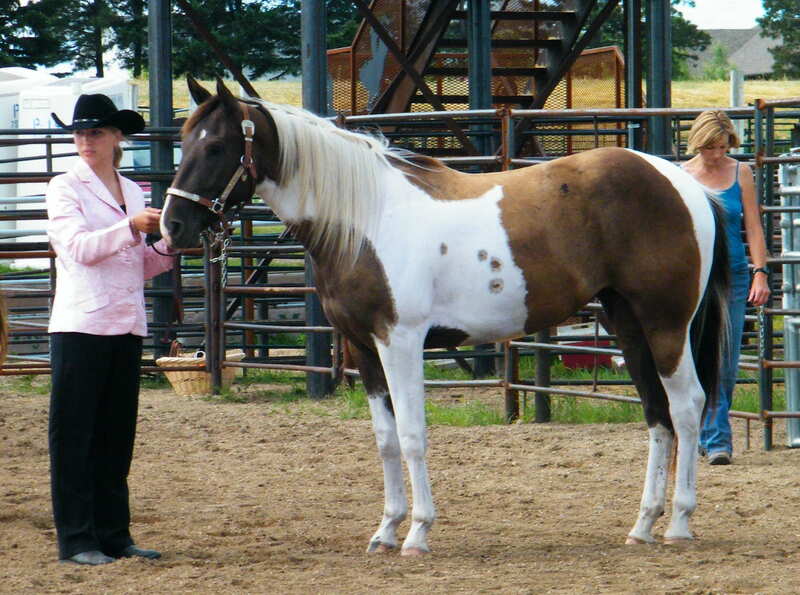 **SOLD Thanks Becky** Buckskin tobiano filly. Started under saddle. Very laid back and willing to please. Email us for more info on JaLandy. **Sold Thanks Corrine of Minnesota** Black and white tobiano filly with a baby doll head. Her dam is 15 hands and puts a winner of a foal on the ground every year. Email us for more info on Jet Deck Shadow. **SOLD Thanks Deb from Neb. ** Black and white tobaino mare, stands 14.2 hands. Broke to ride for intermediate rider. 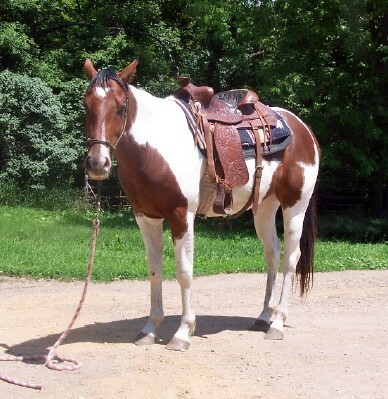 Has been used for lesson horse in arena, trail riding and checking cows in pasture. Goes back to Freckles Flynt half brother to Colonel Freckles. Bred to Exclusive Patch aka Ace for 2016. Email us for more info on Leos Baby Jewel. 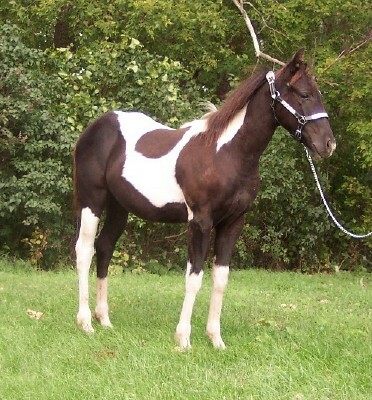 Black and white tobiano stud colt, both parents are homozygous for the tobaino gene. Email us for more info on Lonesome Ghost. 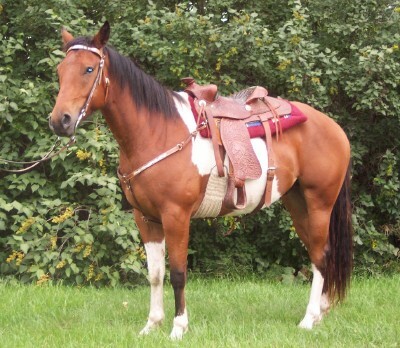 **Sold Thanks Rachel** Bay and white gelding. 30 days with a trainer. Last fall and been riding all summer. He is ready to find his new partner. Email us for more info on Lonsum Ponca. SOLD thanks Laura and Dan in Nebraska!! 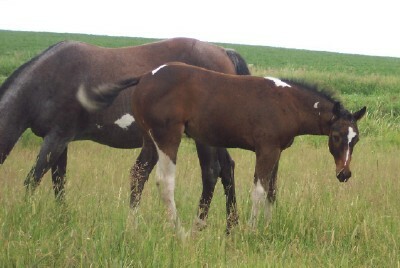 Bay and white tobaino stud colt. 2 blue eyes and a big boy! Email us for more info on Lucky Gambler Eyes. **SOLD!! 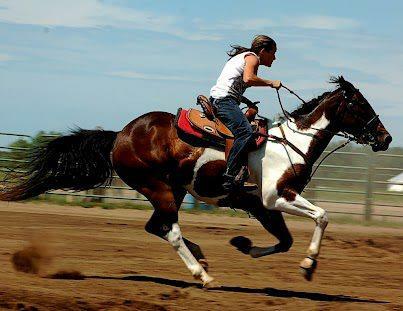 Thanks Duaine, Cindy & Ben** Bay and white tobiano mare, she is broke to ride and drive. Although I have not drove her since I have owned her. Well broke, neck reins, backs, spins. Lucky Sonny Dee on her papers and Deck of Stars just off her papers. Email us for more info on Marcys Deck Of Stars. 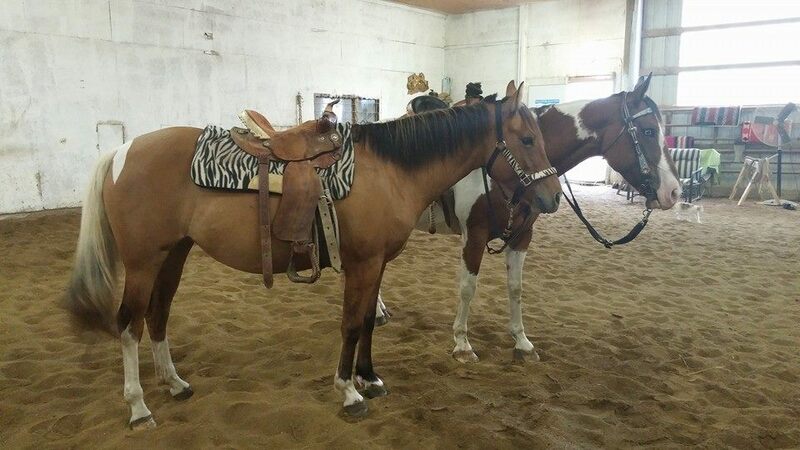 ** SOLD Thanks Janel** Chestnut Overo mare. Email us for more info on Mark The Dice. ** SOLD Thanks Zach** Dun tobiano filly. Started under saddle and doing very well. Nice laid back disposition that will make a kids horse. Email us for more info on Matease Passion Heart. Email us for more info on Mickey Blue Eyes. Email us for more info on Miley. 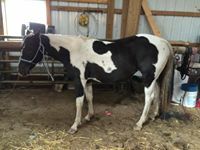 Black and white tobiano mare stands 15.2. Poco Mc Skippy daughter. Email us for more info on Ms Poco Shy Ann. Email us for more info on Native Ghost Spirit. **SOLD Thanks Michelle and Bill** Black and White tobiano filly. Email us for more info on Pasco Patch Hustle. **SOLD Thanks Barb of MN!! 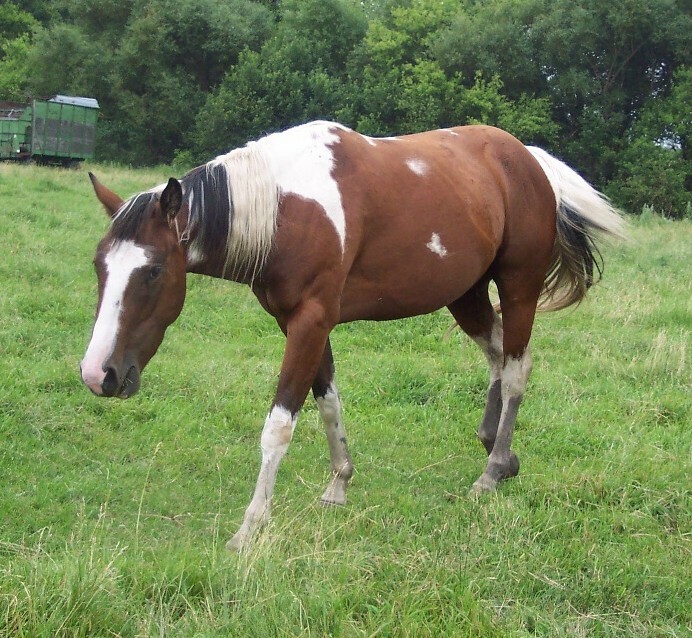 Bay and white tobiano gelding, 2 dark eyes, 50/50 markings. Email us for more info on Pasco Riggen. BLack and white tobiano with 2 blue eyes. Email us for more info on Poco Sonny Ann. **SOLD Thanks Kerrie!! *** Bay filly. In training now. Barrel prospect. Email us for more info on Poconita Page . 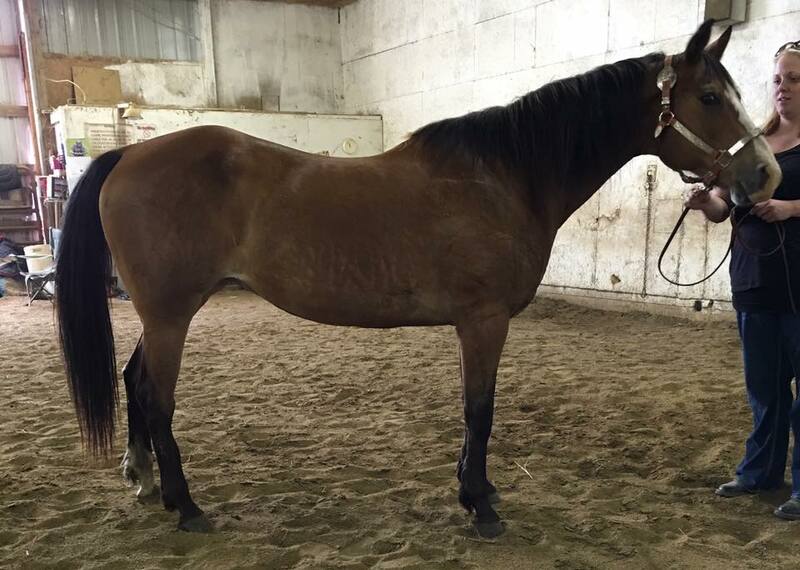 **SOLD Thanks Shylo and family** AQHA sorrel mare that stands 14.2 hands. Broke to ride but has an knee injury that takes her out of competition. Nice speed pedigree. Email us for more info on Precious Fuel. **SOLD Thanks Erin of MN!! 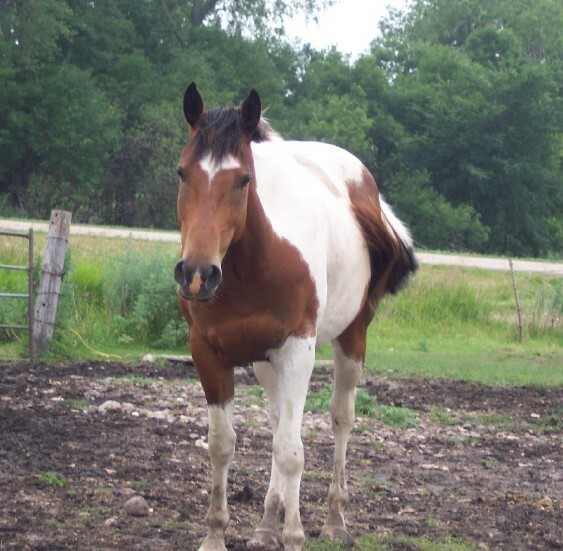 Prince is a bay and white tobiano gelding that will have size to him, both parents are 15.3 hands. 90 days riding on him and is proving to be a nice solid and calm, laid back gelding, rides out alone with no problem, is started on cattle now. Email us for more info on Prince Charmin Silver. SOLD Thanks Jodi & Frank. 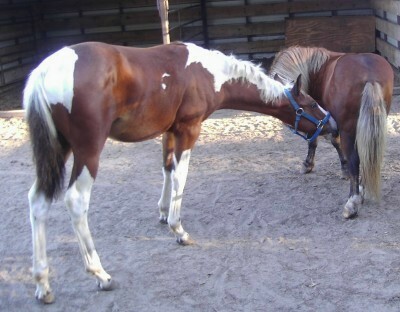 Bay and white colt, homozygous. Email us for more info on Quasar Zip. 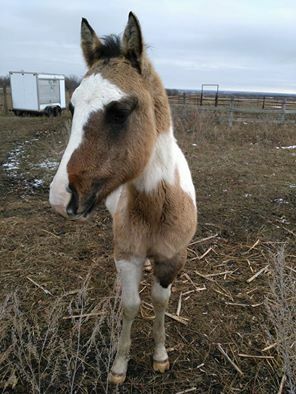 ** SOLD Thanks Kari** Bay tobiano filly, going to live with her other siblings. Email us for more info on Raise Ur Luck. SOLD Thanks Kari and family from MN!! ** He does it all ..... great mind and athletic ...... 1D Barrel Horse, WPRA Money Earner, NBHA World Qualifier, Square Dance horse, Drill Team horse, Trail Riding horse. 2012 UPDATE; Hawk continues to "Soar". Currently winning the WPRA 2D Futurity for the year (nation wide) Has 8 barrel racing points. Email us for more info on Raise Ur Shotglass. 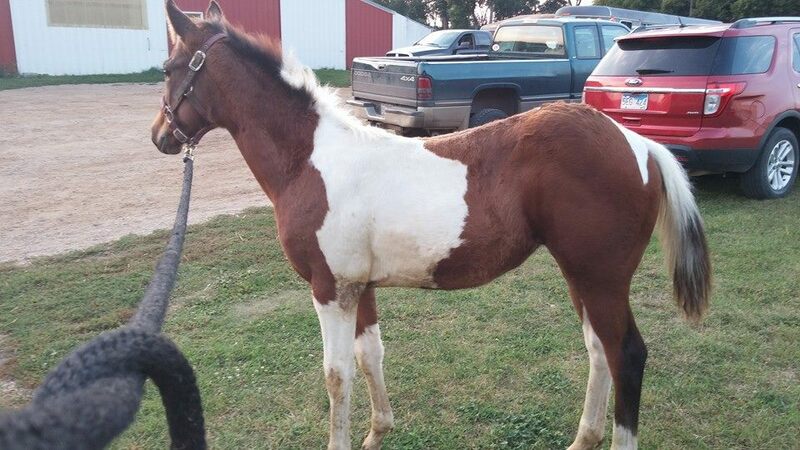 * Sold Thanks Kari of MN* Bay colt one stocking is high enough for a paint. Mare has Special Effort on her papers. Email us for more info on Raise UR White Sox. Email us for more info on Raisin Nevaeh Sky . ** SOLD Thanks Ethan** Bay tobiano gelding. Is a big stocky boy. 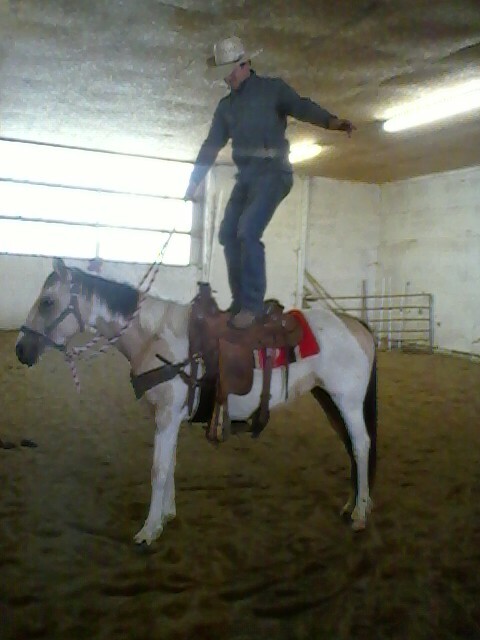 In training now, riding in arena. Price will go up in spring, after he gets outside miles under him. Email us for more info on Red Brewster. **SOLD Thanks Gena** Bay and white filly. Athletic build with plenty of speed in her pedigree, with the likes of "Treasured" and "Raise Your Glass". Full sister to a finished 1D barrel horse. Been on over night trail rides. Email us for more info on Rileys Native Deed. ** Thanks Jesus of Neb. ** Black and white colt. Email us for more info on Rosas Sparky Ace. **SOLD Thanks Kenny** Late gelding. 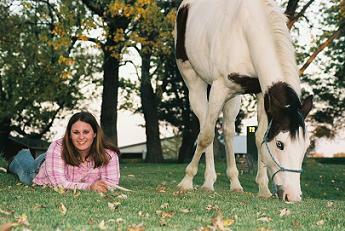 Bay and white tobiano. Email us for more info on Rum Chata. 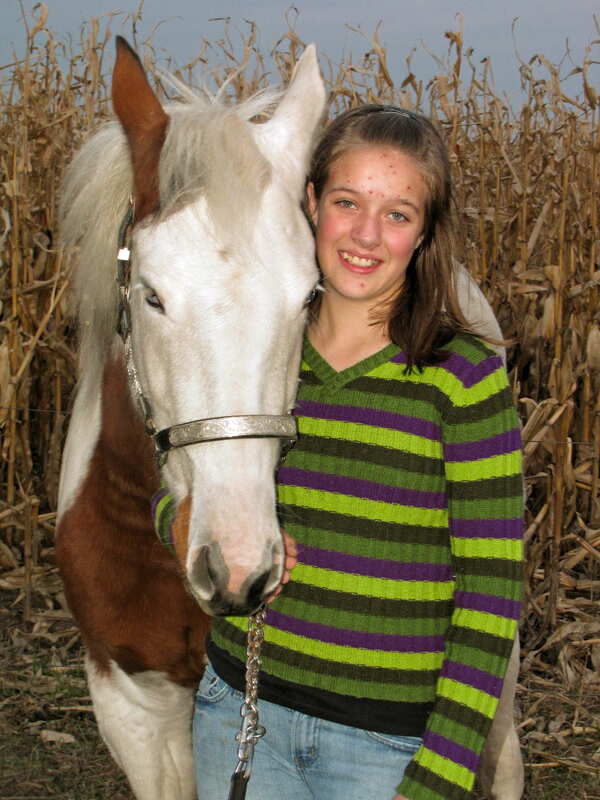 *Sold Thanks Jennifer* Bay and white tobiano filly with 2 dark eyes. 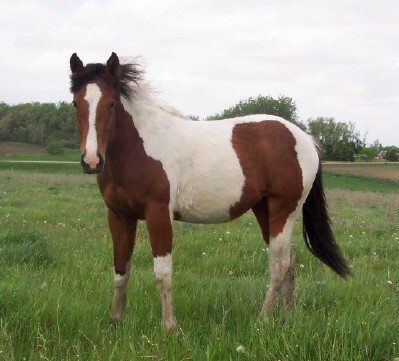 Seaquin is a superb all-around family horse prospect with the color to add that extra bit of pizzazz to your pasture! Has 30 days riding. Email us for more info on Seaquins McCue. ** SOLD Thanks Lincoln** Solid black gelding with white star. Sire: Stormy Pine McCue. Riding in the arena now, working on his outside miles now. Email us for more info on Shys Stormy Renegade. *Sold Thanks Joanie! 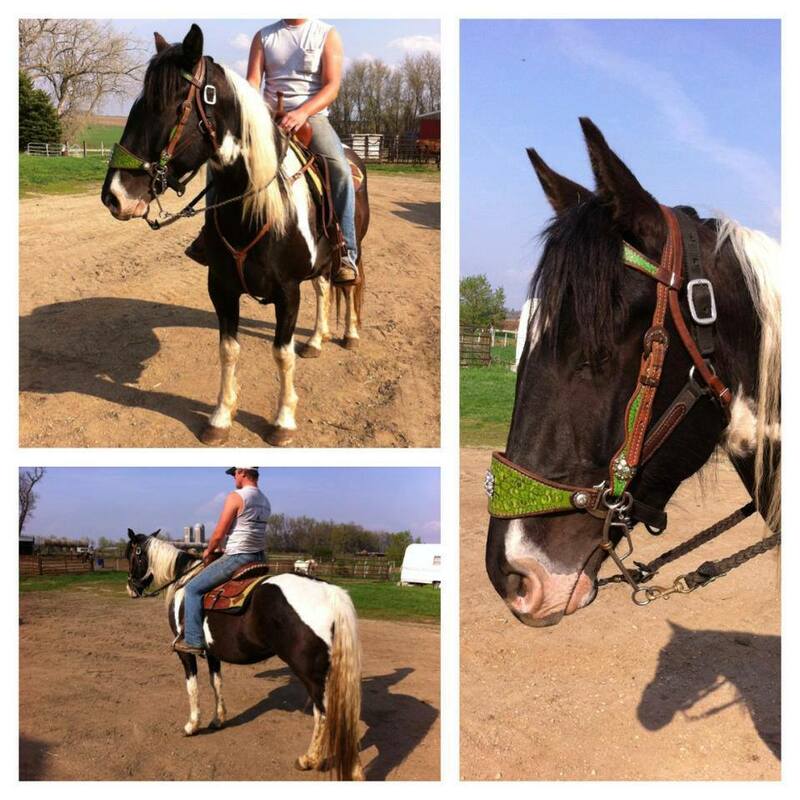 ** Black and white gelding. Registered and halter broke. Email us for more info on Skippy Poco. 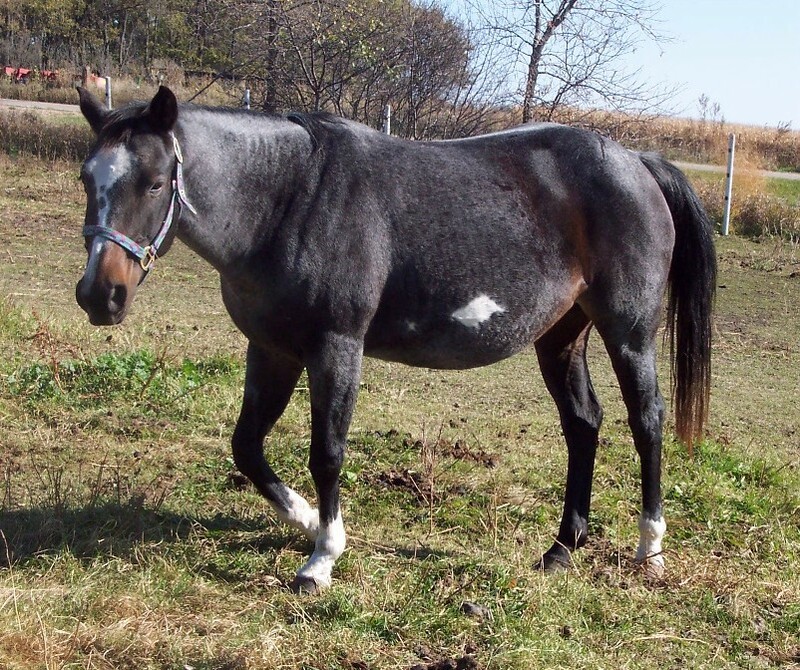 **SOLD Thanks Mimi** Blue Roan overo mare that is broke to ride. 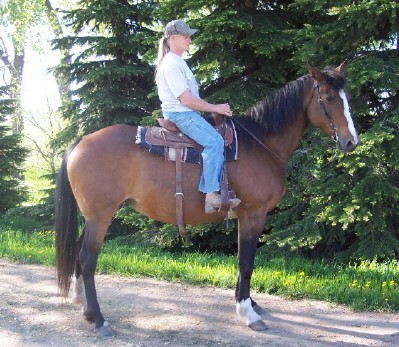 Good solid trail horse, been on overnight trail rides and ridden double with kids in a buddy seat. Loves water, neck reins. Stands 15 hands tall. Email us for more info on Skips Diamond Dell. 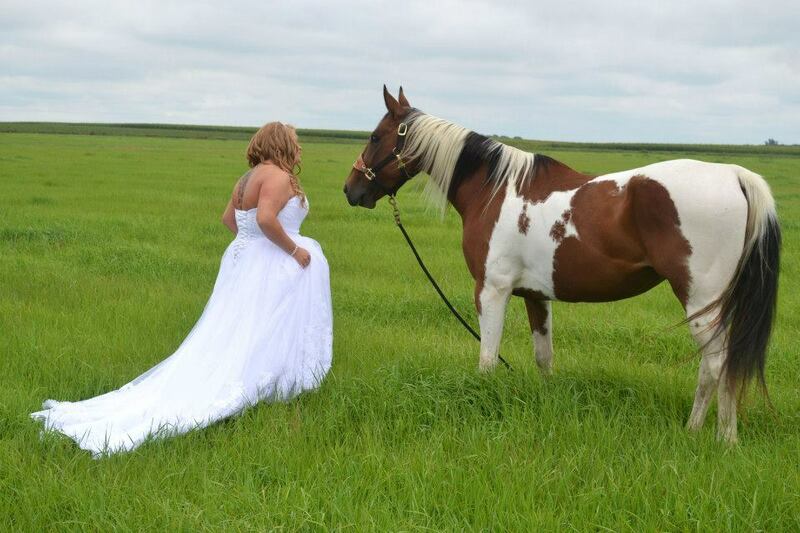 **Thanks Brenda** Palomino AQHA gelding out a "Hollywood Dun it" mare and by a "Shining Spark" stallion..
Email us for more info on Sparky Dunit Shining. Email us for more info on Spontaneous Combustion. Thanks Dan and Mary of MN!! Bay and white filly, pretty head and both eyes dark. 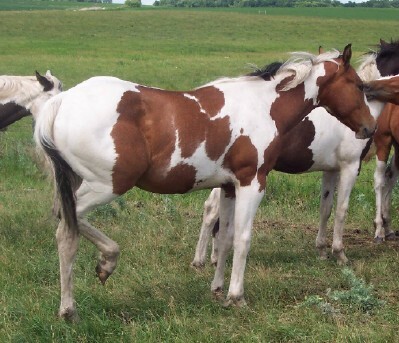 Tested homozygous for tobiano gene. Goes back to Lucky Sonny Dee and Deck of Stars. Halter broke, leads, loads, ties and current on vet work. Ready to be started under saddle. Not only will she make a great riding horse, think about the breeding pen down the road...COLOR, COLOR, COLOR! Email us for more info on Spring on Deck. **SOLD Thanks Teresa of Idaho** Bay and white tobiano filly. Weaned, haltered and loads. The sire stands at 15.3 and dam at 15. Email us for more info on Stormy Hustle. SOLD Thanks Angela of MN!! Update-" She is such a sweet filly and Angela is enjoying her very much! "Bay and wihite tovero shapely filly. 2 blue eyes with eyeliner on a pretty head with a performance pedigree deluxe. Tin man grand-daughter. She should excel in any discipline and wow the judges while she is at it! Email us for more info on Tin Water Lily. SOLD Thanks Clara!! Update Tinky is now living in Texas. I just want to let you know that I have ridden her and she is doing great , she acts like she has been ridden all her life and loves doing it !!! Awesome horse glad that I bought her !! Email us for more info on Tinky Spook Ghost. **SOLD Thanks Jayden** Bay Tovero filly. Both eyes dark. Email us for more info on Tobie Filly. 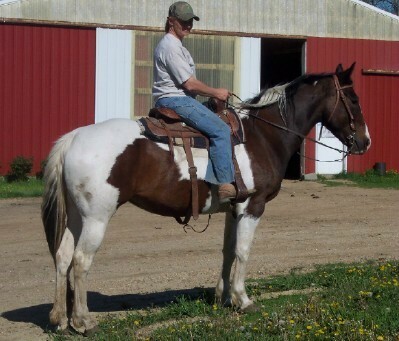 **SOLD Thanks JD** Black and white gelding. Registered and tall, over 15 hands already. Email us for more info on Topaz Charmin Luck. ** Sold Thanks Renee** Dark bay and white gelding. Dark eyes. Will mature to 15.3 hands. 30 days with a trainer last fall and been ridden all summer on trail rides and down the road. Ready to find a new partner. Email us for more info on Traxle. Email us for more info on Treasure colt. 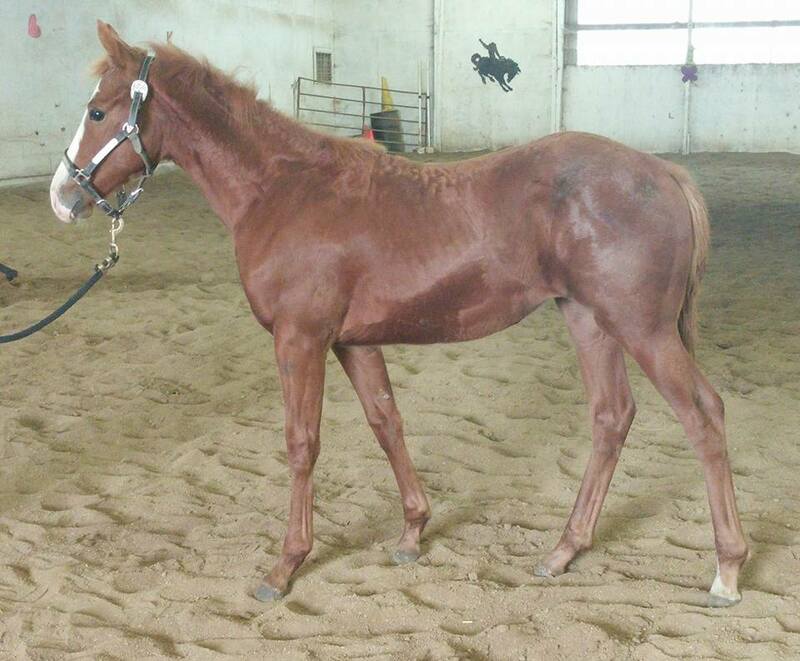 **Thanks Lisa from MN** Bay tobaino colt. Full brother to Raise UR Shotglass, finished 1D gelding, WPRA money winner, Futurity Champion. Email us for more info on Treasure for Ransom. **SOLD Thanks Gina of Kansas** Bay and white tobiano filly. This girl is LEGGY and loves to run, just take a look at the speed in her pedigree! Email us for more info on Treasured Glass. 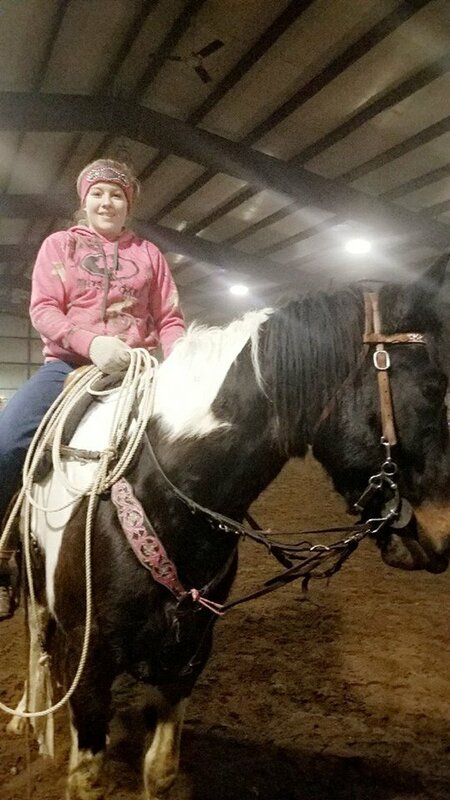 ** Sold Thanks Emilee**Bay tobiano gelding. Sunfrost bloodlines. Email us for more info on Twist N Sunfrost. SOLD Thanks Alexis** Tobiano colt, grulla or buckskin. .
Email us for more info on Willows colt. Sold thanks Jessica of North Dakota! 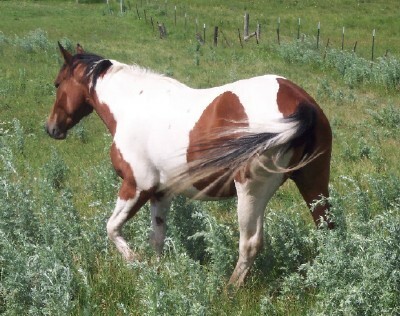 Buckskin tobiano colt. Will mature to 15.2 hands. Halter broke. Email us for more info on Zippin Beach Boy. **SOLD Thanks Jodi and Frank** black and white stud colt, both parents are homozygous. Email us for more info on Zips Exclusive Print. **SOLD Thanks Duffy of Wyoming** Uniquely marked black and white tobiano colt with one blue eye. 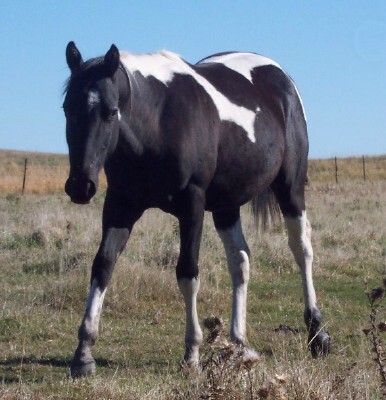 His dam is a 15.3 black and white tobiano whos sire is homozgyous for the black gene. Email us for more info on Zorro Ghostly Trax.